North Korea has agreed to disable its main nuclear reactor and give complete details of its nuclear programme by 31 December, Chinese officials say. The agreement came after negotiations last week in Beijing involving China, the US, Japan, Russia and the Koreas. The US hailed the deal and said it would work with Pyongyang to remove it from the US list of terrorism sponsors. The North tested a nuclear device last year but agreed to end its nuclear programme for aid and other rewards. The deal was announced by Chinese Deputy Foreign Minister Wu Dawei. He said North Korea had committed itself to disabling its experimental nuclear reactor at the Yongbyon site as well as a reprocessing plant and equipment for the production of fuel rods. Under the agreement, a team of experts led by the US will arrive in North Korea in the next two weeks to begin preparing the reactor complex for disablement by the year's end. N Korea's demand for light water reactor to be discussed at "appropriate time"
The facilities are believed to have produced the material for the test device detonated a year ago, proving the regime's nuclear capability. North Korea also agreed to give a "complete and correct declaration" of its nuclear programmes, Mr Wu said. US President George W Bush welcomed the deal. Implementation would end North Korea's production of plutonium, "a major step towards the goal of achieving the verifiable denuclearisation of the Korean Peninsula", a White House spokesman said. US assistant Secretary of State Christopher Hill said Washington would work closely with the North on getting it removed from the US list of state sponsors of terrorism. He described that move as a very sensitive matter. The latest round of six-nation talks was aimed at developing a timetable for the latest stage of the denuclearisation process agreed in February. 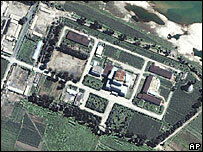 Under the first phase of the deal, Pyongyang shut down the Yongbyon reactor and four other related facilities in July. It also allowed inspectors from the International Atomic Energy Agency (IAEA) into the country. In return, it received 100,000 metric tons of heavy fuel oil from South Korea. A further 900,000 tons is dependent on the North completing the second phase - declaring and permanently disabling all its nuclear facilities. But the BBC's Jon Sudworth in Seoul says the final, crucial phase - surrendering the North's existing nuclear stockpile - is not due to be implemented until next year, and many experts believe this step will prove the biggest challenge. Japan on Wednesday said that despite the latest agreement, it would not resume its aid to Pyongyang, citing lack of progress in the dispute over the kidnapping of Japanese nationals by North Korea. The announcement came as the leaders of North and South Korea met for a historic summit in the North Korean capital, Pyongyang - only the second such meeting since the end of the Korean war. What if North Korea did sink the Cheonan? Who will succeed Kim Jong-il?